When it comes to photography, I have different sides I see. I have the side that observes and wants to photograph the beauty of everyday life, and then the side that grabs my camera when something is being done for the first, or sometimes last, time. This one was a first for us. 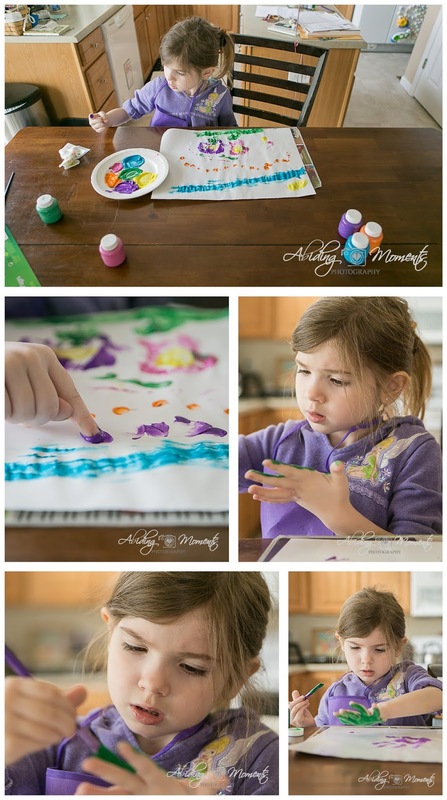 As a stay-at-home Mom, you would think that my girl has finger painted plenty at the age of 5, but actually, until this time, she had not done it before (at least, not with me that I remember - lol). 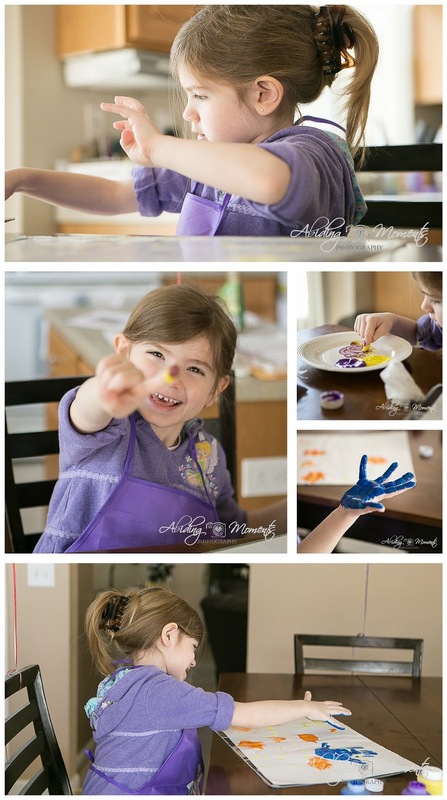 My son hated the feeling of paint on his hands, so finger painting wasn't really on my radar. That in conjunction with the mess (I embrace lots of things, but messes are hard for me sometimes) made this an easy pass. And then we went to the store for a couple of things and there it was: a pad of finger painting paper on clearance for $1. Next to it, a box of paint for $2. My girl, lover of all things painting related, begged me in the sweetest way, "Can we get it? Please Momma? Please?!?" I'm a sucker for her sometimes, so in the cart and home it went. The beginning was a bit of experimenting with ways to paint and mixing colors. And getting a full hand print for the first time was a bit of a thrill for my girl. 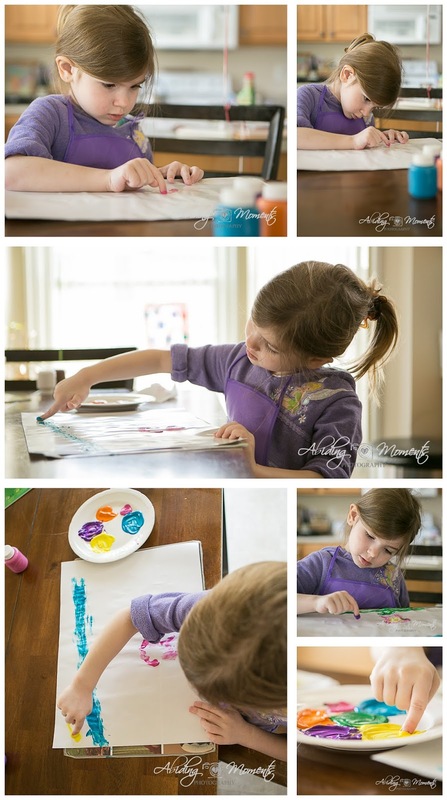 We gave it a try with more paint starting on the paper and just swirling the paint. 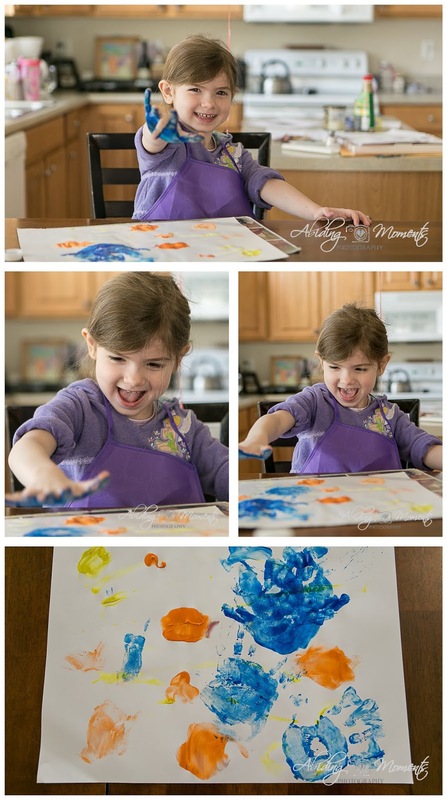 While fun, my girl is often series about her painting and seemed unsure about the results, so I suggested she actually use her finger to paint. That seemed to pull the concentrated artist out of her. 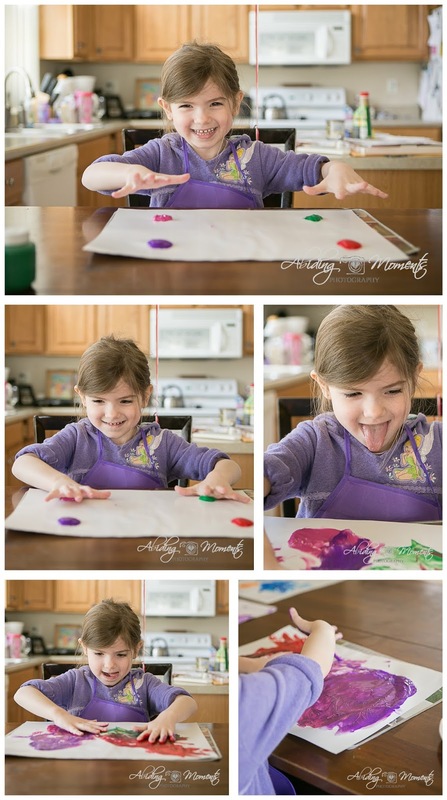 In the end, she still enjoyed painting her entire hand and slapping it down on that paper (I mean, who doesn't). And really, clean up was pretty easy - and totally worth it for the smiles. When our girl entered the preschool stage, like most kids, she got pretty curious about things around her. However, it's been a very different curious than when our son was this age. I like to think that being a girl - or maybe being like her momma - has her asking more detailed questions, connecting things together, and wanting to experience things in person. 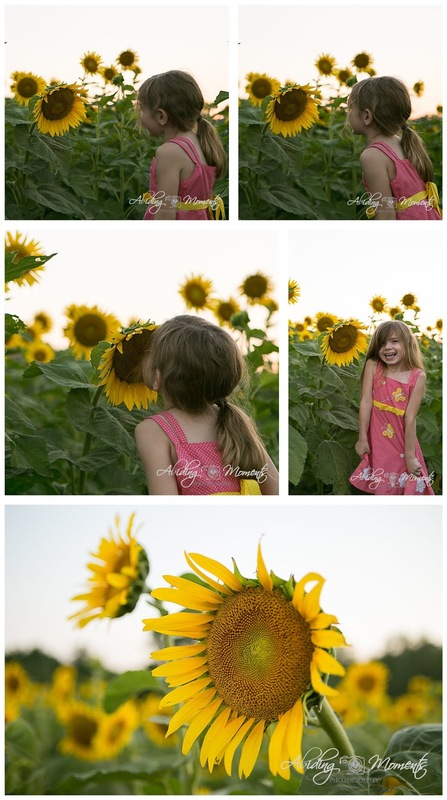 Last summer, she asked about going and seeing sunflowers, but it was too late in the season to find them in real life in our area. 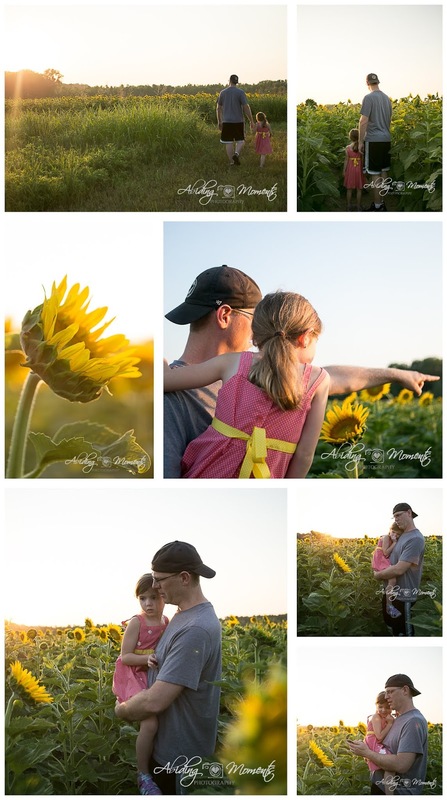 (One benefit of being friends with lots of photographers that do mini sessions in sunflower fields is knowing when prime season is.) In the last few weeks, our girl has also started asking to go outside and watch the sun set. While we often get beautiful colors and clouds outside our front door, being able to SEE the actual sun set isn't very easy. So while our son was away at camp, we planned a night to go hit both, and something like this certainly felt necessary to document. 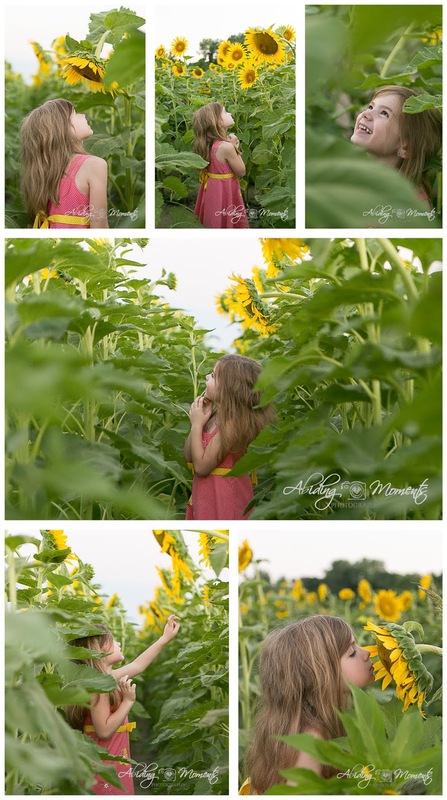 Our main goal was to get our girl up close to the sunflowers to see their real life size, so we dove right in. Daddy made sure to get her up high enough to check out the details on the flowers and see the bees working hard. At first, she was a little unsure of being so close to the bees working. Then Daddy decided to get his phone out for a selfie and she turned on the smiles. I love that my husband offered right away to grab my camera and take a few pictures of us too. We kept checking out the flowers and my girl was interested in figuring out what the bees were working for. 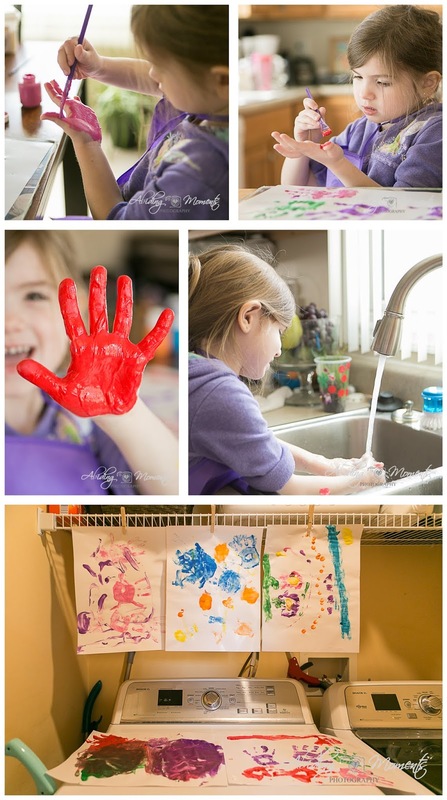 The fun of exploring with a preschooler is the excitement they have in new experiences. Like the look of our girl watching the sun dip below the horizon. And getting braver about seeing those bees up close. After the sun set, we switched fields so our girl could have flowers a little closer to her level. She loved being able to see them without needing a lift and got the biggest smiles when she saw one that was JUST her size! Our girl wasn't nearly ready to go by the time my husband was. 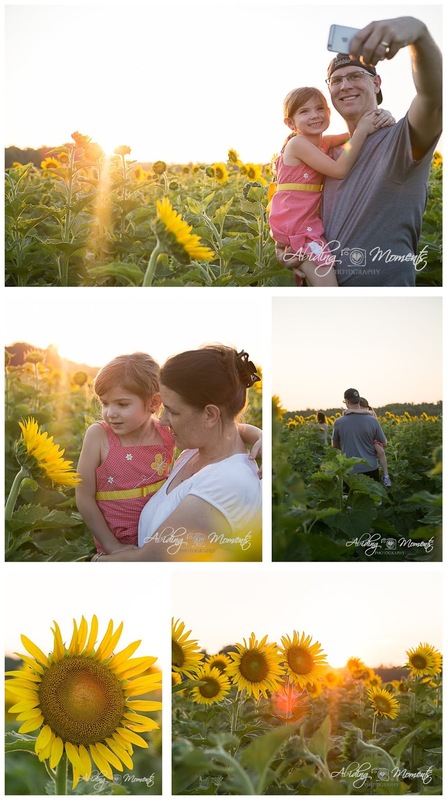 She was so excited to wander through the rows and see those sunflowers up close and personal. 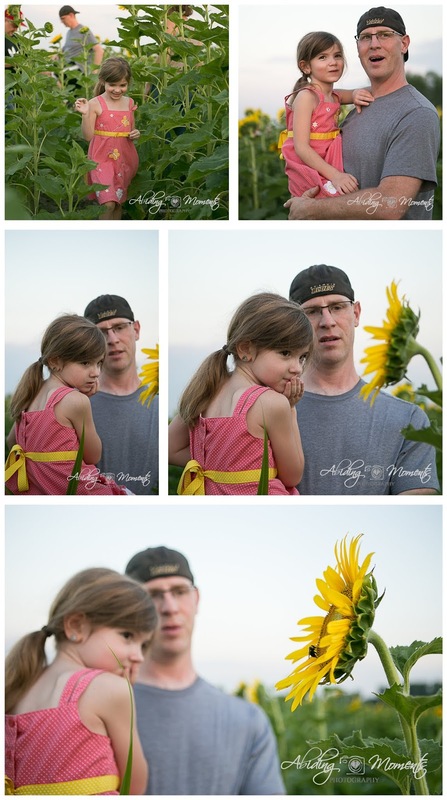 She loved finding "baby" sunflowers, ones that were just her size, seeing more bees working, and looking closely to see the difference between the flowers (and pointing it out). And honestly, my Momma and photographer heart could have followed her for plenty longer, even though we had lost the sun and most of the people that were there photographing. The beauty of real life exists even after the sun has set.